On 14 of its celebrated luxury voyages this fall through spring of 2017, Crystal Cruises is enhancing the plush accommodations for its well-traveled guests. 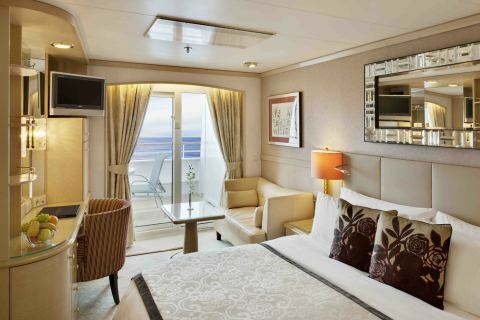 For travelers who book by June 30 a Deluxe Ocean View Stateroom (category C1) aboard Crystal Symphony or Crystal Serenity will be upgraded to a Deluxe Stateroom with Private Verandah at no additional cost (category B2 for Crystal Symphony, B3 for Crystal Serenity). The Sizzling Summer Upgradeaffords travelers savings of up to nearly $1,400, as well as the opportunity to sail one deck higher on the award-winning vessels in order to take in the sweeping views from their personal outdoor space. Space is limited and to book or for more information, contact a travel agent, call 888.799.2437 or visit www.crystalcruises.com. Join the thousands who follow the Crystal Cruises Facebook page and @crystalcruises on Twitter and Instagram to engage in the conversation with #crystalcruises. Crystal Cruises is the World’s Most Awarded Luxury Cruise Line™, having earned more “World’s Best” accolades than any other cruise line, hotel, or resort in history. Crystal Cruises has won “World’s Best Cruise Ship” in Condé Nast Traveler’s Reader Choice Awards for 22 years; been voted “World’s Best Large Ship Cruise Line” by Travel + Leisure readers for 20 consecutive years; and the “Best Luxury Cruise Line” by Virtuoso for two-consecutive years (2014 & 2015). In summer 2015, Crystal embarked on the most significant brand expansion in the history of luxury travel and hospitality, introducing three new classes of cruising – the recently launched Crystal Yacht Cruises (December 2015), Crystal River Cruises (July 2016), Crystal Exclusive Class Ocean Cruises (Fall 2019), Crystal Luxury Air (April 2016) and Crystal AirCruises (2017).